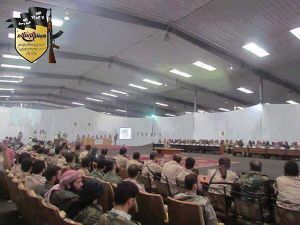 On September 29, 2013 forty-three Islamist rebel battalions pledged alliance to Liwa al-Islam commander Sheikh Zahran Abdullah Alloush (or Alwash) and joined forces to create the Army of Islam (Jaish Al Islam). The Liwa al-Islam YouTube channel broadcast video of the swearing-in ceremony. The meeting was held in some huge industrial hall with some 100 delegates present. The Army of Islam banner follows the design of the Liwa al Islam banner. The coalition shares its name with a Gaza-based US-designated terrorist organization. On November 22, 2013, the Army of Islam merged with a number of other relevant fighting groups and formed the Islamic Front with Zahran Alloush as its "Military Commander". 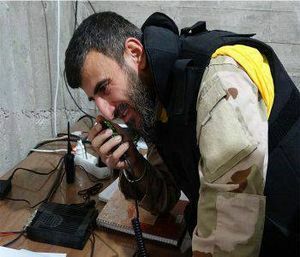 10.11.2015 Zahran Alloush is reported killed; video appears to show the funeral (25.12.2015: video is no longer available; no definite information on the November incident, either) Coincidently, on 25.12.2015 Alloush was finally really killed. As of April 2016, the leader of Jaish al-Islam is Issam Buwiydani. Zahran Alloush was the son of an exiled Salafi preacher living in Saudi Arabia, jailed for his own "salafist activisties," reports Syria Deeply, but was released in 2011, after which he quietly formed a militant group late in the year. 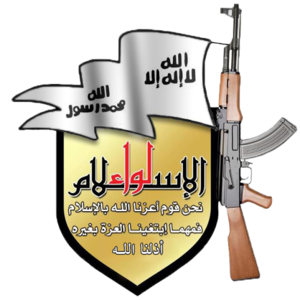 This he named Liwa al-Islam (flag / Brigade / district of Islam)  (note: Syria Deeply says brigade, but Liwa equates to the Turkish Sanjak (wp) for flag, also meaning "district"). The first major public actions of Liwa al-Islam were in July 2012, with bomb assassination of top military officials in Damascus. They continued to grow in power over the next year before their merger into Jaish al-Islam in September, 2013. (Translated): Zahran Alloush was eliminated together with a number of ISIL leaders in their bunker in the area Maarrat al-nu'man, Idlib province.... Yesterday, 1 October, Syrian group Jaish al-Islam (Army of Islam), which is funded by Saudi Arabia declared war on Russia for its support of President Bashar al-Assad. ... apparently the leader of the group went on a visit to the brothers of the ISIS, where it was destroyed by a Russian rocket." No English sources seem to support or refute this claim. Media report: "Jaish al-Islam" group has chosen a new commander after the liquidation of the former one, TASS (Rus. ), quoting Al Mayadeen, Dec 25, 2015. His name (in a transliteration from a Russian report) is Abu Himam Buyadan. Jaish al Islam executed captured Syrian pilot whose SU 22 plane crashed or was shot down near Damascus -Rusvesna, July 2, 2016; Almasdar news, 1 July, 2016. Before the execution, they video-recorded an interview with the pilot. liveuamap.com (spoken Arabic) and after, released a statement Reddit (written Arabic). Syria: More than 40 insurgent groups the most significant of which being Liwa Al islam in Syria merge to form "Islamic Army". This came after 13 militant groups including many core "FSA" joined with Jabhat al Nusra to rejected the SNC "Syrian National Coalition" puppet regime in Turkey and formed an "Islamic unity under Sharia law" a day ago. US puppet regime has virtually lost all influence over the insurgency. This page was last edited on 21 April 2018, at 03:16.